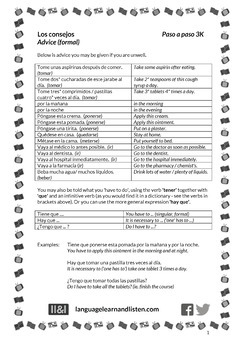 In this worksheet you will learn some different ways to give advice if someone is unwell, including the imperative (formal), and 'tiene que' and 'hay que'. There are 4 exercises. Exercises 1 and 2 consist of phrases using the imperative to translate (Spanish to English then English to Spanish). Exercises 3 and 4 consist of instructions using 'tiene que' and 'hay que' to translate (Spanish to English then English to Spanish). All the necessary vocabulary is provided. Suitable for all levels of ability. Answers provided.